Over 1000 people climbed on board four mobile sukkahs which made their way around the capital during the Sukkot festival this week. 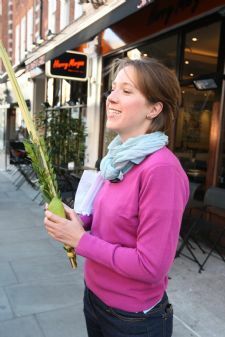 The sukkahs, which were mounted on the back trucks, visited locations in the City, West End, North and East London, as well as going as far afield as Oxford, to allow people to eat in a sukkah, shake the Lulav and Etrog and learn more about the festival. The sukkahs were welcomed by workers in the City and West End where there is a shortage of permanent Sukkahs. Using Twitter and a blog, the locations of the sukkahs were regularly updated to allow workers to find their closest sukkah from the comfort of their office or on their Blackberry. "Despite the rain, over 1000 people came by the sukkahs," said Rabbi Nosson Potash who coordinated the mobile Sukkah project. "Some people came specifically to use the Sukkahs for their lunch break, while others were just curious to step inside and find out what it was all about." "I usually have to walk a long way during my lunch break to find a Sukkah while I’m at working in town," said one city worker. "This year was great since I could go online and easily find out when a Sukkah would be close to my office." One passer-by commented: "I was amazed to see a Sukkah on the back of a truck in Central London. It is a wonderful idea to make Jewish life so accessible to people in this way."